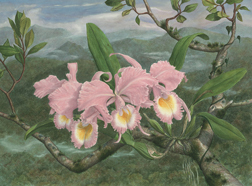 Original watercolor painting of a Cattleya orchid hybrid, Lc Nigrescent 'Flare' by Rose Ganucheau. This painting is one of a series of art works that explores the way we "visualize" the world around us. Lavender is the most mysterious of colors. It doesn't exist as a wavelength of light, only as a combination of two wavelengths on opposite sides of the color spectrum. The color lavender only exists in our brains when we blend the wavelengths of light together. Because of this, purple changes hue greatly depending on the light source. 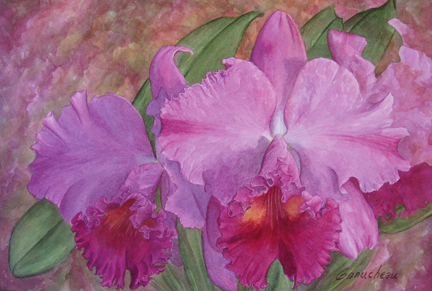 The Color "Orchid" is a state of mind. Work, Full Sheet: 15" x 22"
Limited Edition: Only 100 prints will be produced at the same size as the original work (14" x 21"). Each print is signed and numbered by the artist, and is available for $125.00. (plus shipping).